Russian plane maker Sukhoi has signed a $600 mln contract to deliver 20 Superjets to a European client. 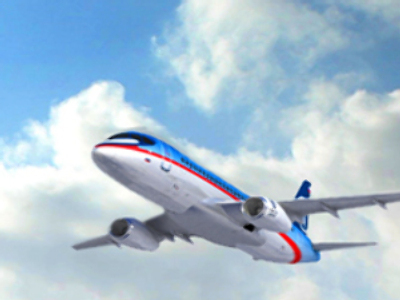 Superjet announced order number 97 on Tuesday from Russia’s Avia Leasing, with a buyer unveiled Wednesday officially “undisclosed”. But the market for regional jets, seating around 70-110 people, just got more crowded. At Farnborough Mitsubushi’s launching the MRJ. The company aims to sell a thousand planes over two decades from 2013, to give it double superjets projected 15% market share. But the President of Mitsubishi Regional Jet, Nobuo Toda, admitted Sukhoi’s seventy year aerospace history gives the Russian project an edge. I already respect Sukhoi and the Russian aerospace industry because you have very much experience in this area. Market leader Bombardier’s launched the C Series this week. Its central fuselage will be made in China. The firm’s senior spokesman, Marc Duchesne, dismissed the Superjet threat. Our aircraft has lower operating costs – 15% less – compared to the current aircraft in service. I don’t believe the Sukhoi jet is currently in service. Mitsubishi and the Superjet are also claiming 15-25% less operational costs over existing best sellers, like the Embraer C170. But the C Series wont be delivered before 2013 and no airline has yet placed a firm order. We’re not being allowed inside because potential client airlines are busy testing it out. Until its in service the only objective comparison is first delivery time on firm orders. And on that the Superjets’ currently four years and 73 planes ahead.